Wheatsheaf public house... 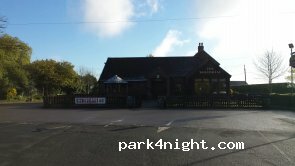 Allows overnight free parking, custom by buying a drink or meal in the pub is appreciated. very close to M6 motorway. Aparcamiento gratuito junto a un pub. A nosotros tras una pinta que consumimos por cortesia nos indicaron que habia conexion electrica tambien gratuita. Ideal para parar en ruta a escocia. A un minuto de la autovia. Price of services : Consumicion de cortesia . Spent an evening hear in March 2019. Quiet and relatively flat spot. 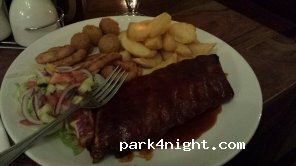 The pub did good food and includes a comprehensive Indian menu after 5pm. 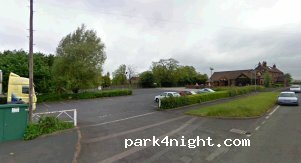 Good for a stopover if travelling as just off M6 junction 11. As of 9 December 2018 there is no power but they are working to get it put back on. Friendly staff and no pressure to buy even a drink in order to stay. A few trees that need trimming and the ground slopes a bit..
Amazing, we stop for the night, quiet & peaceful! Not possible for breakfast or hot drinks till lunch time. 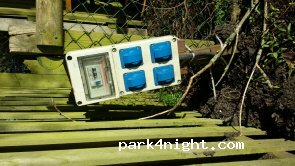 Electric is possible, ask in side the pub. All the pitches are at a slant so you need ramps if you want level. L'arrivée au milieu de la nuit peut faire un peu peur, mais est parfait un arrêt proche de l'autoroute M6. Il ne nous a pas été possible de prendre un petit déjeuner ou simple café. Great place to stop for the night fantastic food especially the curries and electric if you want it. Perfect pit stop. Staff couldn’t have been any more helpful. Although we didn’t the food looked great. Très sympathique, super calme, très bon pour une nuit. Possibilité branchement électrique, pas de vidage. Great pub, good food. 2 mins from M6 and M6 Toll. Parking free and £5 for EHU. Couple boy racers hanging around at night but all in all a quiet spot, situated on a dead end road. There is a sign that says no overnight parking but this is to keep undesirables away. Superb spot - surprisingly quiet (considering proximity to M6) - and a warm welcome in the pub/restaurant when we told them we were in the motorhome. Good selection of drinks, and both traditional pub and Punjabi menu's - we had an outstanding curry, and not at all expensive. Highly recommended. 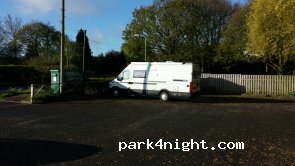 Great place to stop, Landlord very friendly and offered Electric hook up if needed. Free to stay we bought drinks and snacks. Nice quiet location, close to M6. Parking gratuit calme avec pub et très bon restaurant, bien servi. Grand parking gratuit. On y mange très bien et copieusement. (voir photo) ils vous proposent l'électricité pour 5£. L'eau est a disposition gratuitement mais j'ai laissé 1 £. Le personnel sympa y est pour quelque chose. Nous avons fait un arrêt déjeuner sur ce parking de Pub en aout 2016, il est conforme aux précédents commentaires. Je rajouterai qu´il y a une aire de jeux pour les enfants. Aucun problème au 18 août, ils proposent même l'électivité pour 5 £ et vraiment sympa. 30 juillet 2015. le point de stationnement est toujours d'actualité. pub et accueil sympas Aucun problème pour passer la nuit après une consommation. Dom. Lovely place open 24 hours with no camping restrictions. flat ground. Quite park parking. Bit of a slope down but flat at the bottom. We finally found a lay bye in the area. There is a small separation from the road.